Recess is Back! Who wants to play? 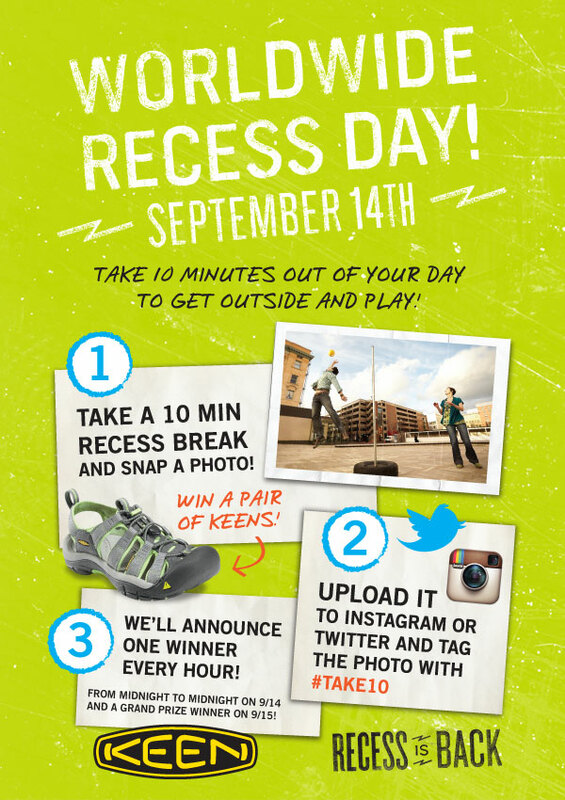 Recess is Back and KEEN challenges you to get out and play for at least 10 minutes on September 14th. Take a photo of your playtime, upload it to Instagram or Twitter with the hashtag of #TAKE10, and you could win a pair of KEEN shoes! A new winner will be announced every hour on that day from midnight to midnight on September 14th! How will you get your recess on? Inspire others with your ideas in the comment section below for a chance to be featured in JP+C’s Top Ten Ways to Recess, to be published on this blog September 13th!